If you’ve ever spent any time looking up strengthening workouts or reading body building articles, you’ve probably come across mention of the Smith machine. If you’ve found yourself asking “what is the Smith machine anyway?”, don’t worry, after reading this you will be in the know. You’ve also probably come across 100 or so articles telling you how awful they are and why you should never use them. Well, I also want to address why they seem to be so hated these days. Let’s start with the basics and make sure we all know what we are talking about. What Is The Smith Machine? The Smith machine is a common piece of fitness equipment. I dare say every commercial gym in the country has at least one of these bad boys. Have you ever seen those barbell systems where the bar seems to be attached to the frame? That’s a Smith machine. Having the barbell attached to rails allows the Smith machine to spot you while you exercise. This is really the biggest benefit of the device. A lot of us are working out by ourselves. Whether you are exercising at home or a club gym, you may not always have access to a spotter. Well, the Smith machine allows you to spot yourself. Not only is the bar attached to the rail system, but it also has pegs every couple of inches where you can lock the bar in place. This is great because if you are squatting or bench pressing by yourself and you get stuck halfway, you can lock the bar where you are and safely exit the machine. Click here for a video tutorial on how to use the Smith machine. The spotting function is great and makes lifting by yourself much safer. However, having the bar attached also limits it’s available motion. Most Smith machines only allow the bar to travel vertically. That is, the bar won’t move forward or backward. Although some devices have a double rail system where you can actually move forward and backward as well (I guess they are still technically Smith machines, but traditional Smith machines can’t do that). But where does the “Smith” part of the name come from? Good question. The answer is actually pretty easy. It comes from Rudy Smith, a guy who took the original idea (invented by Jack LaLanne) and had it modified and then placed in the gyms he was managing. The idea took on and the rest is history. Smith machines are popular in commercial gyms, but they are also popular in home gym machines. A lot of home gyms are incorporating them because they aren’t that expensive and they open up a lot of possibilities for exercise. One of my favorite home gyms combines a Smith machine and a cable system to offer users a wide range of exercise options. We’ve defined the Smith machine, but why do so many people hate them? What’s Wrong With The Smith Machine? Ok, so it’s basically just a barbell attached to a safety rail system. It lets people lift weights safely by themselves without a spotter. Doesn’t sound so bad does it? Why does this piece of equipment get hated on by so many weight lifters? Well, for a couple of reasons really. First of all, I mentioned that the Smith machine limits forward/backward movement. The bar only moves vertically. This motion restriction affects your form during exercise. You basically have to alter your form to fit the machine. Folks that are used to lifting free weights don’t like this because it can make your form feel unnatural. If you’re not careful, this motion restriction can also put additional stress through your joints. This can actually increase your chances of injury, something nobody wants. This is especially common during squats if you aren’t paying attention to your foot placement. The biggest reason so many serious athletes and body builders hate Smith machines though, is that this device makes lifting easier. If you are trying to increase strength and power, you don’t want to make the moves easier. It takes away from the purpose of lifting free weights in the first place. How does it make lifting easier? The Smith machine controls the bar for you (it won’t let the bar move forward or backward) as you lift. The machine is essentially do the work your smaller, stabilizing muscles should be doing. For example, during shoulder press, your rotator cuff isn’t going to work nearly as hard because the bar is already stabilized by the safety rail. Same thing with your core during squats. Some Smith machines have bars that are actually counterbalanced. This actually helps you bring the bar back up. With these systems, you have the bar stabilized for you and the machine is actually helping you lift it back up. This is going to significantly reduce the work your muscles have to do during the exercise. You will also notice that you can lift more weight on a Smith machine than you can with a free weight barbell. Some people might actually like this Smith machine for this reason because they feel they are doing more work by lifting more weight. But if the machine is helping you during the lift, are you actually getting any benefit from the extra weight? Most body builders would say no. They would argue the Smith machine helps you “cheat” your way through the move. And they really wouldn’t be wrong. The gold standard for power lifting and lifting to gain strength is still good ol’ fashioned free weight lifting. So if traditional lifters say “no” to the Smith machine, what do they use to safely lift? The answer would be a power rack. 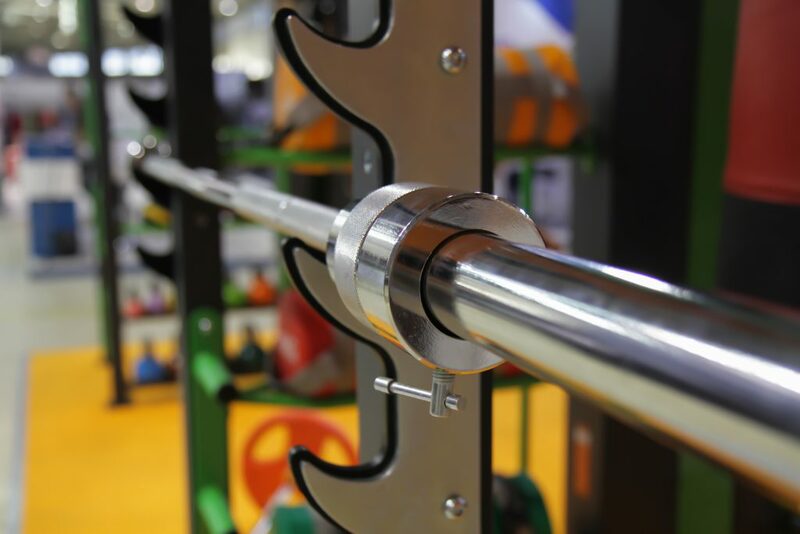 A power rack is a great piece of equipment for serious lifting because it too can spot you, but without the assistance provided by the safety rails. With a power rack system, you are lifting a barbell that isn’t attached to anything. The rack, or cage, has safety bars that can be adjusted to catch the barbell if you lose control. A power rack is basically a Smith machine without the safety rails. But Are Smith Machines All Bad? So there are legitimate reasons for people to dislike Smith machines and I think the above reasons are completely valid. That said, I still like Smith machines. If I was going to a commercial gym these days I’m sure I would still be using one from time to time. If you are a beginner at lifting weights, Smith machines make a lot of sense because they will keep you safe. If you aren’t confident with your squatting ability, these devices will come in handy because it will keep you stabilized. Sure, the Smith squats won’t work you as hard as a traditional squats, but they will still work ya! Assisted squats are still great for blasting your glutes and quads. And speaking of blasting your quads, you can add more weight to the Smith machine (because it is balanced for you) than you could on a free barbell. Does the additional weight make up for fact your muscles aren’t working as hard to stabilize? Probably not, but it might cut the difference a little. But the biggest reason I do like Smith machines is because they spot you while you lift. I’m usually exercising by myself and I don’t like having to wait around until someone walks by that I can ask to spot me. The convenience of being able to lock that bar in any position is enough for me. I pretty much only use Smith machines for squats, calf raises, and shoulder presses. Every once and awhile I would use it for bench press or incline bench press, but not often. I do prefer the traditional free weight lift for those exercises. I must confess though, that I am not a serious lifter and I am not a competitive athlete (unless weekend warriors count). I’ve been lifting weights for over 20 years, but more from the fitness aspect. I like to stay fit and lean, I’m not particularly interested in bulking up and gaining muscle mass. If you are, I agree you shouldn’t be using a Smith machine for those power lifting moves. There you have it. Now you know what the Smith machine is and what it’s used for. We reviewed some of the biggest arguments for and against it’s use. Personally, I understand why so many people are against Smith machines, but I still see value in their use. I have used them for years and still made significant fitness gains. I’ve also lifted without them for years. All depends on the program I am doing and how I’m feeling. If you have back issues or joint problems, the Smith machine may be able to help you perform certain moves safely. But beware that the Smith machine can add unwanted stresses to your joints if you aren’t careful. Keep a close eye on your form. I’d love to hear what you guys think. Arguments for and against the use of Smith machines would be greatly appreciated. Leave any comments or questions below and I’ll get right back to you.